Xbox Live's "Summer of Arcade" kicked off with some serious heat, courtesy of Twisted Pixel's 'Splosion Man, an original side-scrolling platformer that lets the player do one thing: explode. Or 'splode, as they say. That's what our fiery hero does, blowing himself up to jump, bounce off walls, ignite exploding barrels, and turn enemies into piles of meat. Every face button on the Xbox is mapped to 'splode, with the controller's right bumper performing a suicidal reset, which 'Splosion Man can use should he ever get stuck. That never happened in my playthrough of the Xbox Live Arcade game, a fast paced sprint and 'splode escape from an underground science facility that's an incredible 50 levels long. Should you fire up a download of 'Splosion Man, or is this one-mechanic pony a dud? Rapid Fire Fun: 'Splosion Man can be a thrilling roller coaster ride of chained explosions, requiring expert platforming skills, lightning quick reflexes, and many, many deaths. It can be frustrating at times, as it's nearly impossible to know when or where one should 'splode to make the next jump, with dangerous pools of toxic waste and hovering platforms sometimes annoyingly out of view. But Twisted Pixel transitions the player from death to rebirth in a flash, with amazingly fast reload times, lessening the pain of re-re-repeating a level. Dynamite Presentation: The titular 'Splosion Man is awesome to behold, a gangly matchstick of a man with a permanent grin on his flaming face. His running animation is always changing, always clearly insane, which makes just watching our heroic platform jumper a treat. Catchy music and amusing character design—enemies burst into a rain of hams and steaks—make 'Splosion Man easy on the eyes, if ultimately a bit repetitive. There's even a great visual pay-off/punishment for using the "Way Of The Coward," the level-skipping option one will be presented with upon too many deaths. Hangs From The Ledge Of Greatness: And boy can 'Splosion Man become repetitive. There's very little variety to the game's visual design, with the game's 50 levels split up by a tiny collection of bosses, characters we'd much rather forget than ever revisit. The game's brand of humor can quickly become grating, especially when one's banging their head against a particularly tricky section—that missile launching, eye-beam firing, catchphrase spewing dullard of a boss, for example. 'Splosion Man also suffers from some camera quirks—it pulls out too far at times and angles oddly at others—that are responsible for some eye-rolling deaths. Like Twisted Pixel's previous Xbox Live Arcade entry The Maw, 'Splosion Man is a very good game that just narrowly misses the mark of greatness. It's priced lower than what it offers, which is a very capable platformer from an increasingly impressive developer. There's plenty of replay value here, thanks to a great multiplayer mode and time-based challenges. 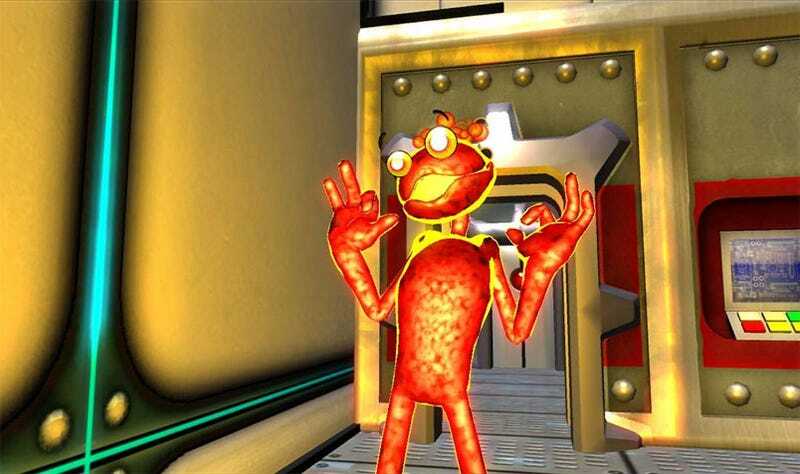 With the exception of a few annoying personality quirks, 'Splosion Man is one of the best game's XBLA has to offer. Certainly one of the most original, even if all you do is explode. 'Splosion Man was developed by Twisted Pixel Games, released on July 22 for Xbox Live Arcade. Retails for 800 Microsoft Points ($10 USD). Played single player game to completion, tested multiplayer.